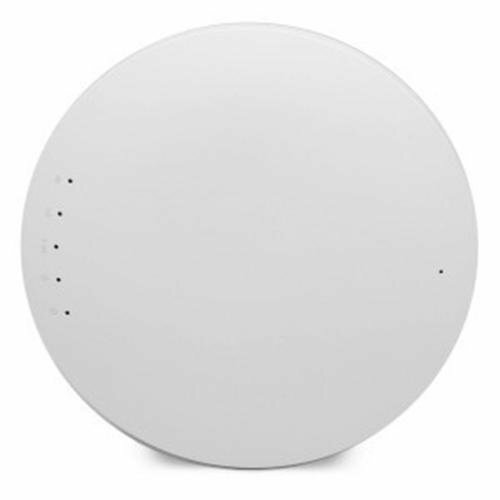 The Open-Mesh MR1750 is a cloud managed, dual band, 802.11ac mesh-capable access point that includes hardware watchdog, standard 802.3af POE support and a single Gigabit Ethernet port. With the ability to support up to 50-100 simultaneous users, this access point is ideal for dense, high-traffic locations such as retail and office spaces, schools, shopping malls and hospitality venues. The MR1750 is cloud managed and includes a license for CloudTrax, Open-Mesh's cloud-based network controller. Now you can deploy access points in minutes and build, manage and monitor your network from anywhere. The MR1750 is backwards compatible with OM2P and most later OM Series devices2 (requires firmware upgrade) and MR600 and later MR Series devices, so you can run them on the same network. For optimal range, the MR1750 will mesh with other devices over the 2.4 GHz band only. Deploy concurrent 2.4GHz + 5GHz ac-ready networks to let newer phones, tablets and laptops fly while still supporting legacy devices. The MR1750 is available in a 3x3, 450+1300 Mbps MIMO configuration for strong performance, even over mesh. COMES WITH 24V POWER SUPPLY. Support for standard 802.3af PoE to power your access points up to 350 feet away over a single Ethernet cable*. Great for PoE switches*. Includes a license for CloudTrax, Open-Mesh's cloud-based network controller. No on-site server required.